Parents are registered at St. Mary’s Basilica or attend on a regular basis. There will be a three month waiting period before the baptism is scheduled. Or, parents have a historical relationship to St. Mary’s Basilica. Example: Parents baptized at St. Mary’s Basilica or were married here. Example: A connection to the Franciscan friars. 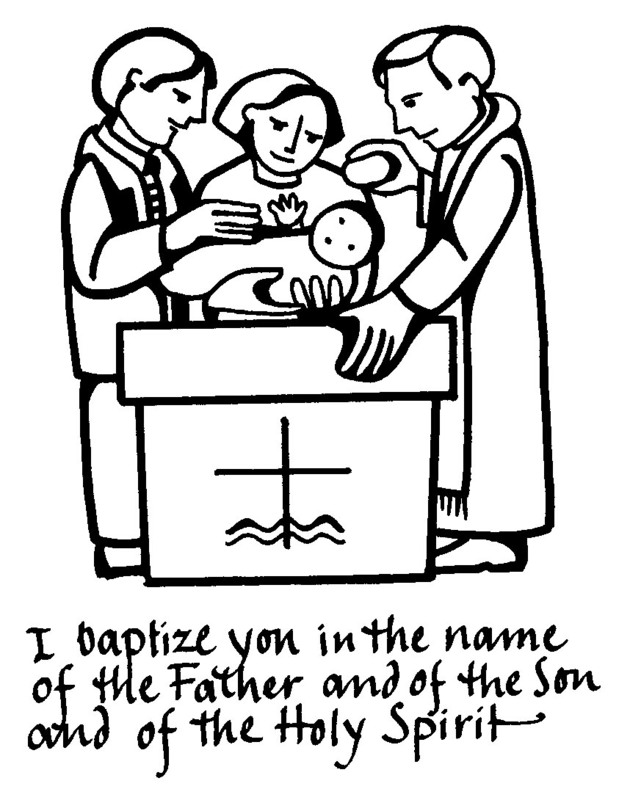 Note: We are required to receive permission to baptize your child from your registered parish. We must have this permission before a baptism can be scheduled. The sincere desire to raise the child in the Catholic Christian faith. Registering and attending the baptismal preparation session. Selecting godparent(s) based on Canon Law. Children will be baptized from infancy to 6 years during a Baptismal Service and occasionally during the Saturday 5 PM Mass. Children 7 years and older are required by the universal church to be prepared in a two year process called the Rite of Christian Initiation of Adults (RCIA). For more information on the Rite of Christian Initiation contact Theresa Losada at tlosada@smbphx.org. No Baptismal Services during the Month of March. No Baptismal Services during the Month of April. No Baptismal Services during the Month of July. Parents and godparents unable to attend the schedule Baptismal Class before their child’s baptism may attend another schedule baptismal class to fulfill their obligation before their child celebrates the sacrament of baptism. If parents and godparents are unable to attend our baptismal preparation classes due to travel complication they may attend a baptismal preparation class at another parish. Parents or godparents will then be required to obtain written proof from the parish stating they completed the class and submit it to St. Mary’s Basilica. A godparent must be a fully initiated Roman Catholic, (baptized, confirmed and receiving the Eucharist), at least sixteen years of age and are a practicing Catholics since they are to be a role model for the newly baptized. Parents (biological or adoptive) of the person to be baptized may not serve as godparents. A baptized non-Catholic may be chosen as a Christian Witness provided there is at least one Catholic godparent who meets the above criteria. A Christian Witness is allowed whereby they are from another Christian community and practice there faith. The Christian Witness needs to provide a letter from their pastor confirming they are active in their Church. However, before selecting a Christian Witness contact Fr. Ed to see who is considered a Christian Witness. In addition, a written letter/document from each of the godparent’s registered parish stating they are in good standing (not under a canonical penalty, whether imposed or declared) must be provided to St. Mary’s Basilica. Letters will need to be received by the 1st week of the month before the schedule baptism. If they are a registered parishioner at St. Mary’s Basilica we will not need a letter/document. It is appropriate to dress the child in a white baptismal gown; however any formal church attire is appropriate. A symbolic white stole will be provided by the church as part of the rite of baptism. Do I need to provide a baptismal candle? A baptismal candle will be provided by St. Mary’s Basilica. What if the godparent or Christian witness cannot be present? 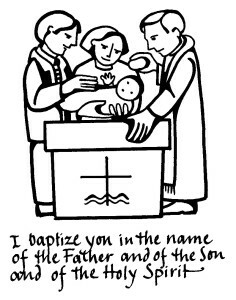 A proxy may stand in on the day of baptism for either a godparent or a Christian witness, but it is required that they attend a baptismal class before the baptism as well. The godparent or Christian witness, not the name of the proxy, is listed on the baptismal certificate. What if the Godparent(s) or Christian witness cannot attend the Baptismal Class? If a godparent or Christian witness is unable to attend this class due to travel conflicts they must take a baptismal preparation class at another parish and then provide a written confirmation from that parish to St. Mary’s Basilica. Do we need to arrive early to reserve seats on the day of Baptism? St. Mary’s Basilica will reserve seats before Mass for all families and godparents celebrating the Rite of Baptism. Parents and godparents are required to arrive at the Church a half hour before the beginning of Mass.